Topping up the fuel of my hire car in Bergville I was keen to get inside and buy a cool drink. I checked the temperature gauge – 37 Celsius. Inside in the air conditioned building I picked up a guava juice, paid the attendant and checked the weather forecast on my phone – heavy snow. I stepped outside into the heat. The intense heat of the previous days made snow seem rather unlikely. That evening I met Hougaard at Witsieshoek, a mountain retreat high up in the Berg. After sharing a few Anglo-Saffa witticisms we launched into hopes for the upcoming days. 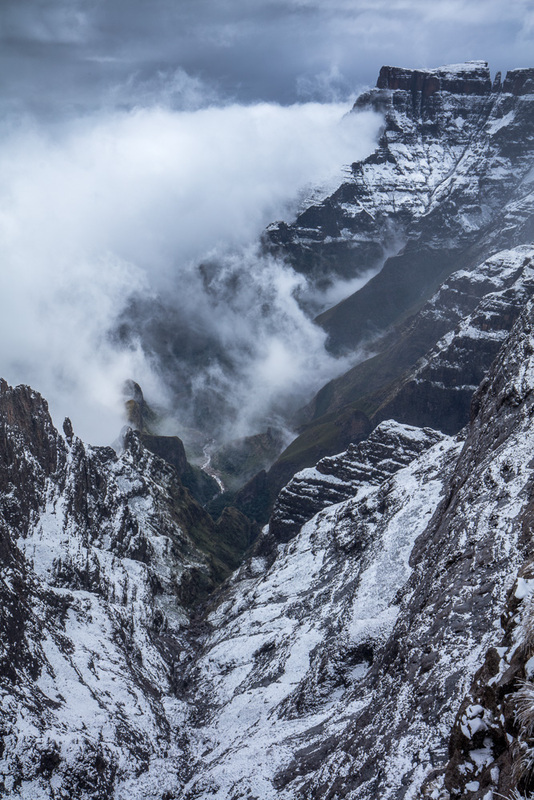 Hougaard was after snow whilst I was anticipating heavy rain – at least that would get Tugela Falls going. 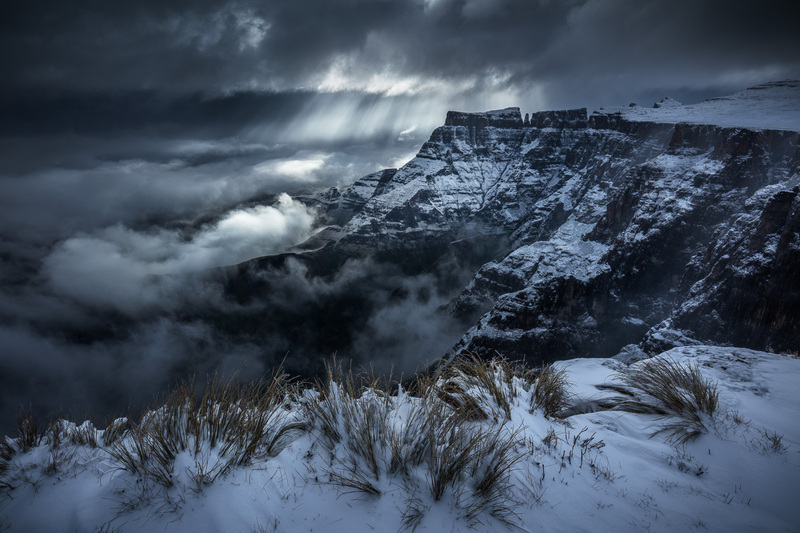 Hougaard arranged the trip a year previously for members of a Facebook group associated with his landscape photography gear business. The aim was to camp on the Amphitheatre for a few nights and see what came of it. Hearing of his plans earlier in the week I was asked if I wanted to join. I would stay for the first two nights before returning to Joburg to pick up a group of my workshop clients. I was gradually introduced to a ramshackle bunch of guys mostly from the Cape. It was clear that for some of them this was to be an entirely new experience. 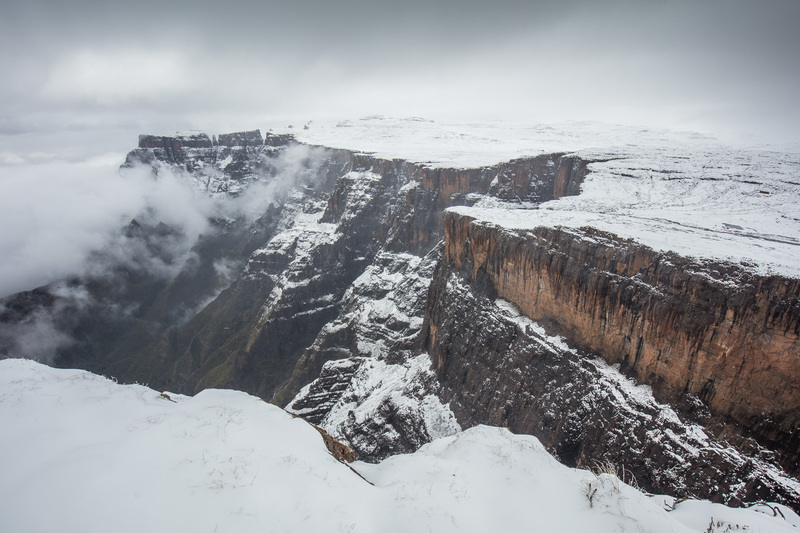 The Drakensberg is no joke at any time of year, but with heavy rain, snow and strong winds forecast some of our group seemed hopelessly underprepared. 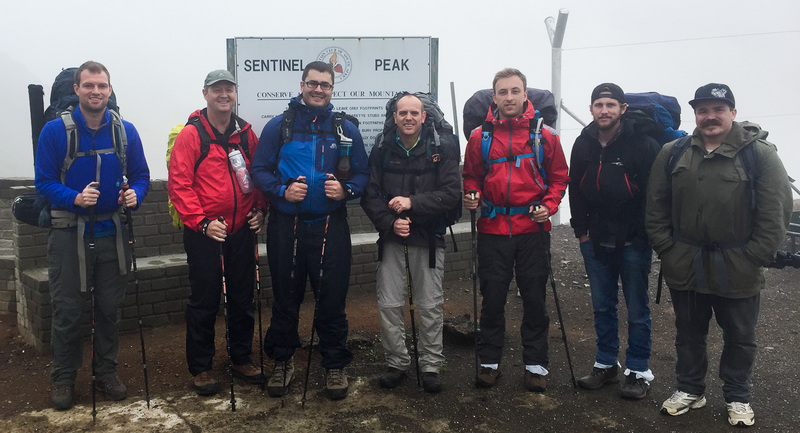 Trainers, jeans and cotton clothing have no place on a mountain, particularly not in the snow. Add in a complete lack of experience and you have a potential recipe for disaster! That night I had a much needed sleep in a bed (I had been camping up to that point) and woke up raring to go. We met up at breakfast and, a couple of bacon sandwiches later, promptly watched the heavens open. Several millimetres of rain fell in a matter of minutes – a reminder of what might yet happen. Our group. A mixture of experience and equipment! We caught a transfer up to the Sentinel car park and started our hike in cloudy but dry conditions. Every time the skies grew dark I worried about the rain, not wanting any of us to get caught out. Mercifully it never came. The chain ladders, the only real difficulty on route, were navigated without any issues by the group and before long we were setting up our tents on the south side of the Tugela River. So began *The Waiting Game*. Cloud was with us throughout on that first day. The landscape was snowless, uninspiring and devoid of views. Since everyone was now safe inside the tents I began to hope for apocalyptic rain, but only occasional showers came. Most of the time in the tent was spent playing ‘Countdown’ on my phone whilst Hougaard read a biography of Elon Musk. We went to sleep hoping for change in the morning. Overnight the gentle patter of rain gradually grew silent as the temperature dropped. The alarm went off a while before sunrise and we emerged to a covering of snow and biting cold air. The South Africans, in some sort of snow delirium, set about vastly over estimating the snow depth at anything up to a foot. It was a little less than two inches, but it was beautiful. Pristine, white and velvety it was the kind of snow we all hope for but rarely find; if only that cloud would lift. Hougaard led an optimistic charge to a viewpoint for sunrise. I stayed much closer to the tents at the edge near the falls expecting the poor visibility to continue. A while later everyone returned to the tents – much like me they had little reward that morning. Waiting inside a tent is always a risky game, particularly with the doors zipped shut to keep out the cold. The best images often come as the weather changes, so if you notice your tent suddenly lit up by direct sun the chances are you’ve missed your moment. Fortunately our excited group was on constant watch; every glimmer of an opportunity was capitalised upon. So it was that I found myself running through the snow towards the edge of the Escarpment as a shaft of light broke through in the distance. The rays moved and reformed next to the Eastern Buttress catching the low cloud below. Above were the vast snow covered ramparts of the Amphitheatre, their structure and scale revealed by the snow. It was a scene of overwhelming grandeur. I composed the frame, pressed the shutter, checked the image and held my hands up in celebration. I would have done the whole trip for this image alone; a rare moment. 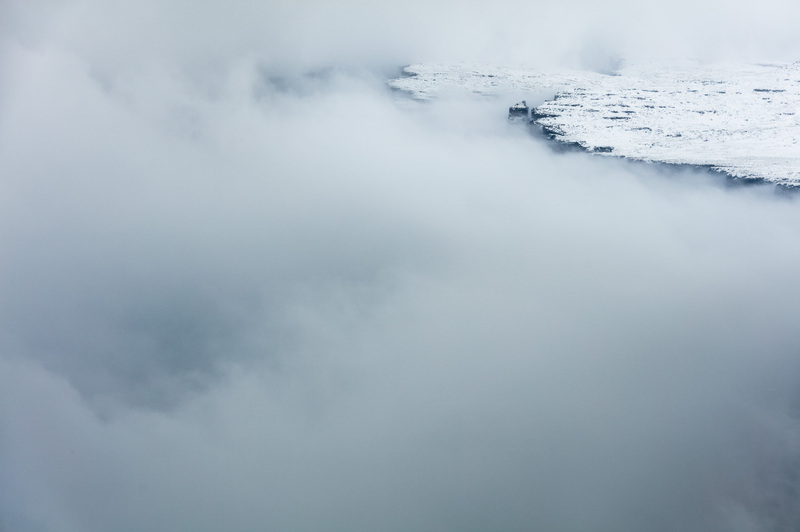 For the next 20 minutes the sky occasionally broke up with the clouds below the Escarpment adding an amazing sense of depth. I tried a number of different compositions, responding to the changes in the cloud. Before long the snow returned. 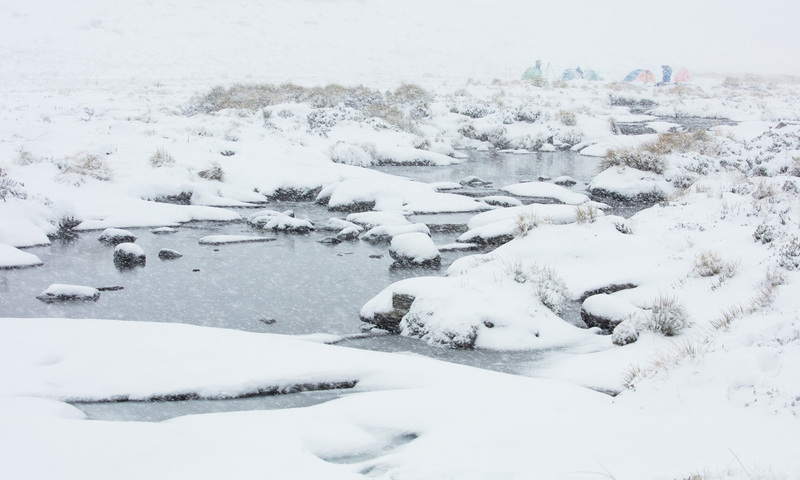 The Tugela River and our camp when the snow had set in once more. Later, once the snow had eased, I made my way up towards Sentinel Peak to the viewpoint Hougaard and co. had tried at sunrise. On the way a view down a gully provided a brief opportunity but for the most part I struggled with the flat conditions. The view down the main gully on route was a welcome surprise. The Tugela can be seen at the bottom after its colossal plunge. My hopes to capture a shot of the Escarpment with the hills of Lesotho beyond ultimately ended in disappointment despite waiting in worsening conditions for nearly two hours. A view I wish I had had the conditions for! You can make out our tents on the right had side. The cloud eventually filled in the Amphitheatre but the wind on top kept it pegged back just below the rim. I started to become aware of the thin cloud and my vision started to go, so bright was the snow. I pulled my buff up over my face and descended the mountain looking through a mesh of red fabric. All the while I cursed myself for leaving my sunglasses in the tent! The rest of the afternoon was spent back At camp, but after the burst of fantastic light that morning the wait had a very different feel. This time I was paying my due! The following morning brought with it clear skies and a significant temperature drop from the previous night. Our boots and water were frozen in the porch overnight and as I stepped out of the tent the cold felt like an entirely different animal. I had planned to return to the viewpoint for my image, but I hesitated, walking to the edge first to check for an inversion. After more hesitation I decided I didn’t have enough time left for the hike and settled on more modest ambitions, a decision I still slightly regret! 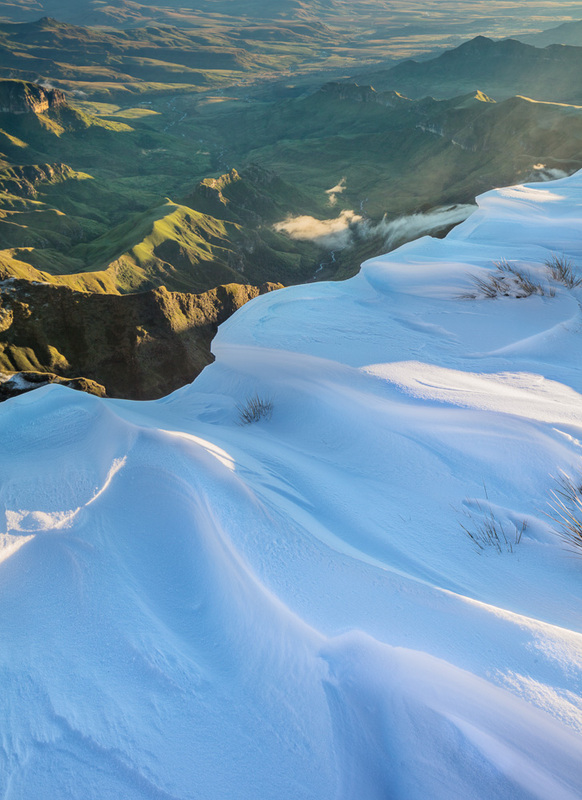 I spent 20 minutes before sunrise looking for interesting snow formations to use as a foreground eventually settling upon some windblown snow slightly above the main plateau. The shot itself was a little awkward technically – shooting at 30mm didn’t allow sufficient depth of field for a single frame so I focus bracketed. I also exposure bracketed for the tonal range. Getting 2 sets of shots with strong spindrift was a real gamble but luck was on my side that morning. Exposure bracketed and focus bracketed. A tricky shot to pull off given the dynamism of the scene. One crystal clear mornings in the Drakensberg it isn’t long before the light becomes too harsh to work with and I managed just one more image before it was time for me to pack up, walk off the mountain and head back to Joburg. I think ultimately this image sums up best the experience of being up there: winter in summer. An apt final image. 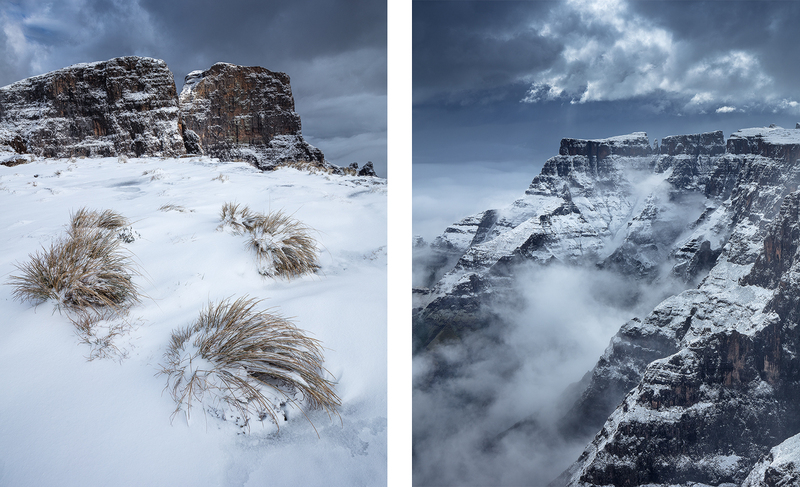 Winter on top of the Berg, summer in the valleys of Royal Natal below. Written by alexnail, posted on 4th December 2017 at 12:26 pm, in Trip Reports. Permalink. RSS feed for this post. Absolutely stunning Alex! Gorgeous Gorgeous Gorgeous! Nice write up Alex. Must have been quite an experience to be up there in snow. Also, it’s incredible those guys made it with jeans and trainers! Thanks Esen and yeah…I was just really glad bad winter weather never came so those guys were just a little damp and with cold feet! What a trip ! The photos are fantastic ! Thanks you for sharing these magnificent photos of my favourite mountains – what a wonderful experience, event for us couch potatoes! My pleasure Gayle. Thanks for the comment! Thanks Mitchell, we were super lucky! Great photos Alex! Looks like you had perfect weather for the photos! Some awesome stuff here. 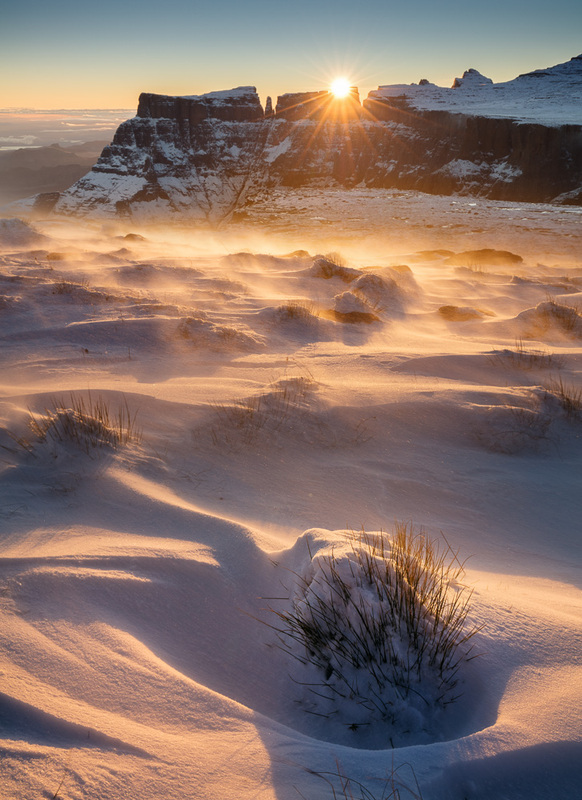 The shot of the escarpment with the light breaking through is an absolute cracker.